I have to start simply. In part because I began this at the tail-end of the winter frost, but mostly because I have NO IDEA what I’m doing. I’ve begged the internet for advice only to find that my remedial starting point is so far below what most gardeners consider beginner that reading alone won’t suffice. 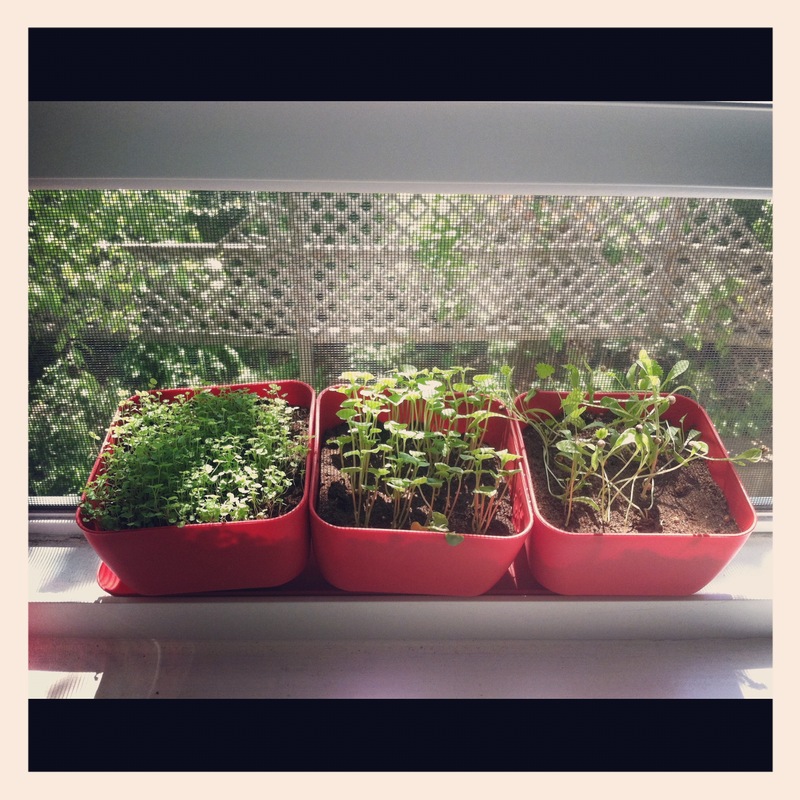 I needed to start small and understand the basics, so I’ve begun with herbs.Why herbs? Well, my grandmother was also a darling cook and the idea of making use of my creation is exciting AND fiscally responsible! Plus, I can start indoors which makes for morale boosting gratification. Finally, there seems to be a lot of help in literature and chat boards on how to grow indoor herbs. Perhaps this is the stuff of novices but THINGS ARE HAPPENING! Just look at the evidence! 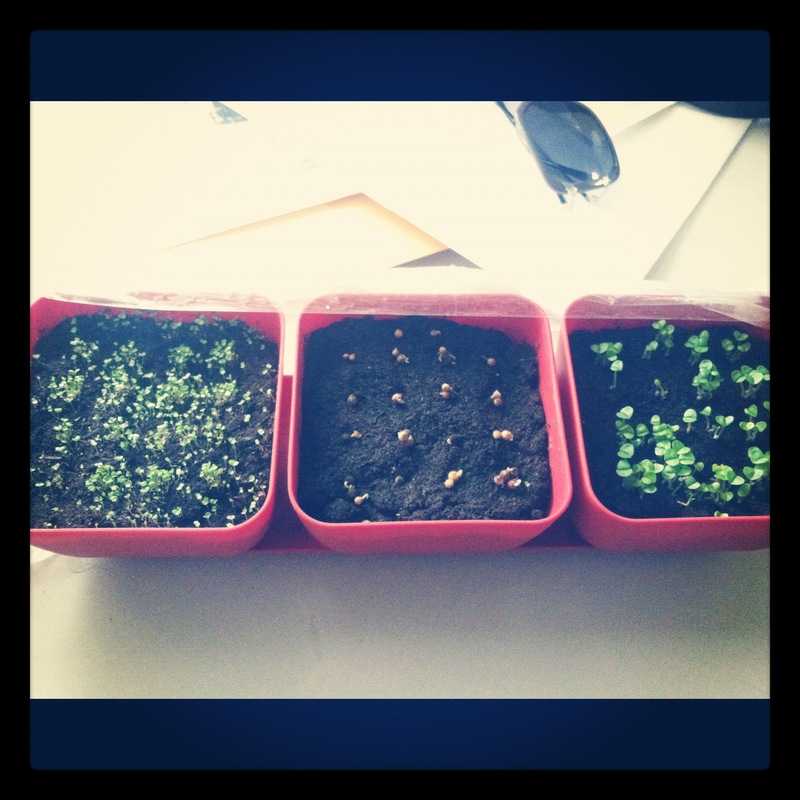 I bought a little starter kit and seed packets of cilantro, basil and oregano. After moistening the soil and distributing even amounts into pots with holes in the bottom, I spread the seeds out to avoid crowding. (The pictures will document that I got a little too excited and planted an egregious number of seeds. This is a urban herb garden). After that I wrapped my darling pots in plastic wrap to capture moisture and left them in the sun to their own devices until I started to see things bloom! It was tempting not to poke and prod, but I kept them packaged until sightings of a second leaf appeared (as per my seed packet instructions). When the leaves courted I unwrapped and continued to feed and water them. At present they are still infantile, but look at the progress! It’s encouraging to see things grow. Am I becoming somewhat maternal? Maybe, but that can wait. I’m saving all my love for these little guys now. Dinner party to come!